Finally the wait is over. Coinciding with the May 1 reboot and the expansion of the European Union, this could be as good an occasion as any to release V3 of HayoBethlehem.NL! The release date was actually thanks to May First Reboot. This project gave me a great incentive to finally finish a project I had started 3 months ago. The redesign was well, necessary. 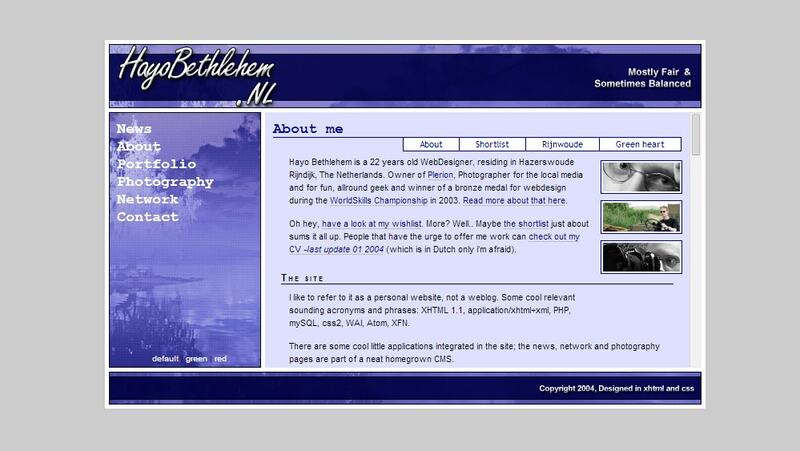 The old website was build on the ancient building blocks of HTML4 and Frames. Whilst immersing myself in the wonderful world of webstandards and css based webdesign it became increasingly apparent to me that if I wanted to jump on that boat, besides building customer websites in that way, I had to refresh my own site as well. Anyway, to make a long story short, here is a rundown of the facts. The graphics were created in Photoshop 7 and distilled from a photo I took in Sweden. The site is coded XHTML Transitional and CSS. CSS allows complete and total control over the style of a hypertext document, which makes it possible to use neat tricks like defining print markup and also alternate stylesheets. The site works properly on most modern browsers, but if you read this as plain text, you should definitely upgrade. The news section was lovingly hand coded in PHP using a homegrown news management system. In addition to this, the photography section is now also a great php/mysql application, which will enable me to post images more often. To add to the celebrations, On 1 May 2004, large parts of Eastern and Western Europe were united in peace and democracy as the EU expanded to 25 Member States. Ten new countries joined the European Union – Cyprus, the Czech Republic, Estonia, Hungary, Latvia, Lithuania, Malta, Poland, the Slovak Republic and Slovenia.